As Recorded by The Beatles. By John Lennon and Paul McCartney [The Beatles]. By John Lennon and Paul McCartney [The Beatles]. Arranged by Jerry Burns. 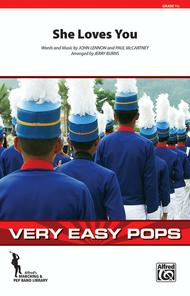 Marching Band; Performance Music Ensemble; Single Titles. Very Easy Pops for Marching Band. Rock. Part(s); Score. 85 pages. Duration 1:45. Alfred Music #00-40195. Published by Alfred Music (AP.40195).